The biomechanics of barefoot running have been studied quite a lot - mainly it has been shown to decrease the risk of injury because when a person runs barefoot they land softer and their legs experience decreased ground reaction forces. I wanted to further explore the physiological aspects of barefoot running and see if it could help an athlete's performance. The purpose of this study was to investigate the energy expenditure involved with running barefoot and running shod on the treadmill as well as overground. Ten subjects volunteered to participate in the study, and the age range was 19 to 29 years. The subjects were healthy, reported no previous lower limb injuries, and ran at least 10 miles per week for six months prior to the study. All of the subjects participated in the four experimental conditions: 1) barefoot on treadmill, 2) shod on treadmill, 3) barefoot overground, and 4) shod overground. For each condition, the subject was instructed to run for six minutes at 70% of their vVO2max pace. To correct for air resistance a 1% grade was used on the treadmill. 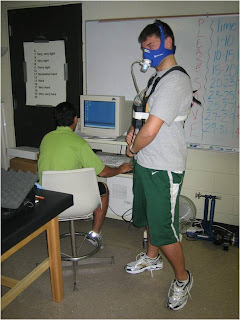 Steady state VO2 was collected, as well as Rating of Perceived Exertion (RPE) and heart rate. A 2x2 repeated measures ANOVA was used for analysis of the data. Running with shoes showed significantly higher VO2 values on both the treadmill and the overground track (p<0.05). The heart rate and RPE were significantly higher in the shod condition as well (p<0.02; p<0.01). For the overground condition, running with shoes displayed 5.7% higher VO2 values than running barefoot. In the treadmill condition, the difference was 2.0%. From the results of the experiment, the following can be concluded: 1) At a given velocity, barefoot running shows significantly lower VO2 values than running shod; this indicates a higher running economy when barefoot. 2) When a 1% grade is used on the treadmill, there is not a significant difference in VO2 values between running on a treadmill and running overground. What I found, essentially, in my study was that when the subjects were running barefoot they were more economical. The main finding that barefooter runners might like is the overground condition. I think overground testing is much more applicable to everyday runners than treadmill testing, as most runners prefer to run outside and see the world! Take for example one of the subjects: He was running on an indoor track at the university at 7 mph for both conditions- with shoes and without. When he was running barefoot his body required less oxygen than when he was running with shoes on. This basically means that it was easier for him to maintain that same pace while barefoot. Over the 10 subjects the average increase in oxygen uptake when people went from barefoot to shoes was 5.7%. This was very interesting though because economy of barefoot running hasn't been studied before overground and the results were great! The economy can kind of be explained like gas mileage with a car. More economical cars can go further on a gallon of gas than less economical cars, just like one could go further on a certain volume of oxygen if they were barefoot. There are studies on barefoot that say that wearing shoes while running make the risk of injuries higher. I thought it would be a big thesis help for you but unfortunately you already finish yours. Well, I wish you published it online for us to see it.